(DAVIS, Calif.) — Only 50 spots are available for Sudwerk’s 2015 Brewers Cut, a club that guarantees access to its best barrel-aged beers. Membership opened to the public on Dec. 9. When the program debuted last year – after the holidays – it sold out in less than a month. Sudwerk’s barrel-aged beers earn repeatedly high reviews from critics, like The Sacramento Bee’s Blair Anthony Robertson, who on Dec. 5 lauded “the magic that happens in the barrels.” Sudwerk’s “barrel-aging brings so much character to the beer,” he said. Brewers Cut beers strive to define new styles that represent the Sacramento Valley. The barrel-aged beers offer a taste of the Davis terroir. They use local wine and whiskey barrels, and wildly ferment from local bacteria and yeast. Each release is a once-in-a-lifetime experience, with a taste similar but unlike any before or after it. 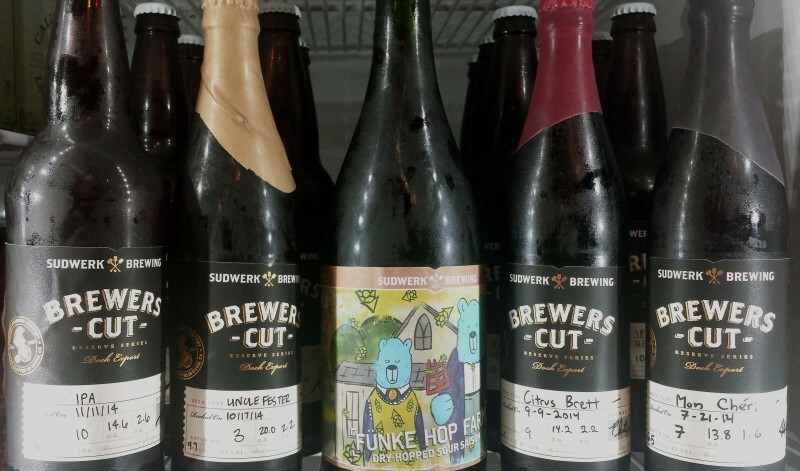 Brewers Cut beers are the best of the Sudwerk Brewing Co. barrel program, and include sours, wild ales, Saisons and more. Bottles, which range in size from 550 to 750 milliliters, are hand-labeled, wax-dipped and signed by the brewer. Popular 2014 beers returning for 2015 include the Buffalo Theory (sour stout) and Funke Hop Farm (California wild farmhouse ale). Sudwerk barrel master Phil Emerson is priming the first 2015 Brewers Cut beer for release around mid-January. Members can pick up their beers three days before they’re available to the public. Bottles must be picked up by the next beer release (about two months later). The 2015 membership price is $170. To reserve a membership, email Brady Price at [email protected], call 530-756-2739 or ask a bartender at the Dock Store. Watch for news on release parties for these Brewers Cut beers, where fans can taste the beer on tap and buy single bottles, while supplies last. For details on these and other Sudwerk Brewing Co. events, visit https://www.facebook.com/sudwerkbrew. Building on 25 years of family legacy and brewing tradition, Sudwerk Brewing Co. specializes in artisanal brews, specifically West Coast craft lagers. Its taproom, The Dock Store, at 2001 Second St., Davis, Calif., has winter hours of 5 to 8 p.m. Tuesdays, 4 to 8 p.m. Thursdays and Fridays, and 2 to 8 p.m. on Saturdays. It offers a rotating menu of experimental and innovative beers, “honest pints” and growler fills, fresh White Labs brewers’ yeast, and good conversation. Learn more at http://sudwerkbrew.com.